With the news that the Schleck brothers are to leave Bjarne Riis’s cycling team, time is running out for the Dane to find a new sponsor. The presence of the two lanky brothers is a real draw for any sponsor given the podium potential in the Tour de France. In the short term it’ll be interesting to see if the Schleck-Riis relationship works in July, certainly my concern is that the brothers spend too long looking out for each other rather than nailing their rivals. With their departure, they might be less willing to listen to astute tactical advice from the team car, putting fraternal harmony ahead of victory. Above all, it shows that the Schlecks have lost patience with Riis. What will be interesting to see next is whether any other key riders chose to jump. 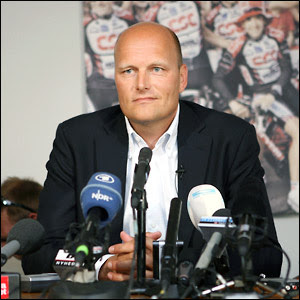 The likes of Cancellara, Fuglsang and Breschel will determine whether Riis has a roster to offer sponsors. It’s not over for Riis yet. If he can keep these riders then the team will still be attractive, above all if he lands a big name then he can make new signings. Roman Kreuziger is one rider interested in a new team and could be a logical signing. The Shlecks always put fraternal harmony ahead of anything else: yesterday's Lux road race being the most recent key example of that. They lack the ability to work independently when required even within Saxo Bank so I think if you've got the Schlecks you rather know what you are going to get (sometimes yay, sometime no). Sometimes it works, sometimes it doesn't. I can't imagine I'll be the only fan frustrated if Andy doesn't attack in the mountains because he's busy looking over his shoulder waiting for Frank (and I say that as fan of both). That's of course assuming there isn't any tension within the team during the Tour which I do have to wonder about. I do however think it's entirely fair for them to move teams if they so chose – the sponsorship saga being a completely valid reason. The fact that it seems to have been quite furtive is unfortunate though I realise conducting such an affair openly wouldn't be possible. I also wonder whether this had anything to do with Sunderland leaving Sky. In terms of the team, Fuglsang won't be parted from the Schlecks, Cancellara or Breschel may be a different matter. Given that some of the Saxo team are based in Lux anyway, you have to wonder though what scale the defection will be. As far as I know Cancellara has a Contrat until the end of 2011, so he is bound to Riis unless he fails to come up with a new sponsor. So I guess the new team will form around Cancellara. Also Riis has proven himself as a good scout, coming up with new promising riders. So, maybe the team won't be a contender for Grand Tours anymore without the Schlecks but as one day race an classics hunters I can imagine them pretty well. Led by Cancellara for the cobbles, Morkov for sprints and Sorensen and Breschel for hilly terrain. I'm with you their Natalie and to the anonymous commenter, thanks for the mention of Cancellara's contract, that's a very good point. Next post: Basso: "I want to win the Tour"